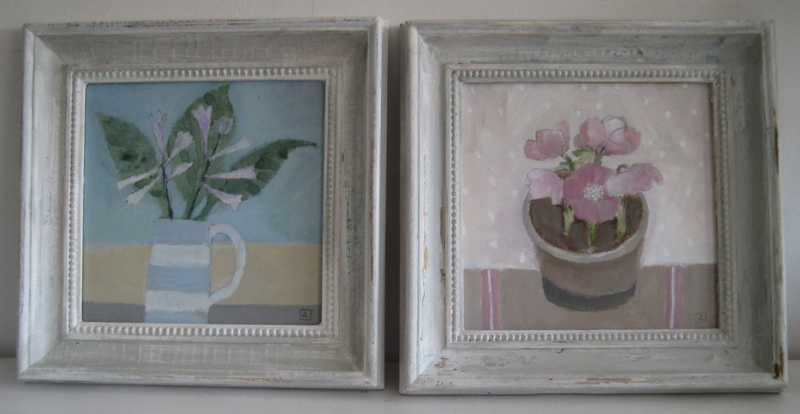 I have been getting paintings ready for mixed exhibitions and have just about finished 16 new ones. At one of the places I show my work they suggested distressing frames so that’s my new look. These frames aren’t really distressed, they’re quite happy in a sort of Boho-Chic way. Well I think they look OK but we’ll see what reaction I get. This entry was posted in Art, artists, Exhibitions, Life, Living in North London, Painting, Uncategorized and tagged acrylic, Bury St Edmunds, Chelsea Art Fair, distressing, flowers, frames, galleries, garden, hellebore, Hosta, Iona Gallery, Josephin Harpur, new, painting. Bookmark the permalink.